In an 18-month project to equip leaders with new insights and tools for the people-side of change, this initiative created a 43% increase in participants’ readiness to cope with the complexities of organizational transformation. The US military continues to undergo significant change to address the changing global context. Just as many companies face the need to become more adaptable and transformational, the armed services are engaged in similar rethinking and restructuring. 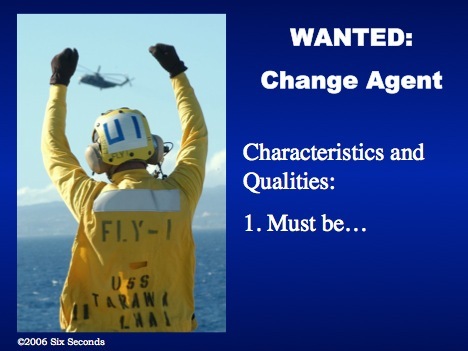 For example, for hundreds of years sailors have served on a particular ship; now sailors will move between ships as needed – creating a complex and dynamic workplace team in a high-challenge, high-risk, high-stakes context. Section IX of the National Security Strategy of the United States mandates transforming America’s military to meet the challenges and opportunities of the twenty-first century. 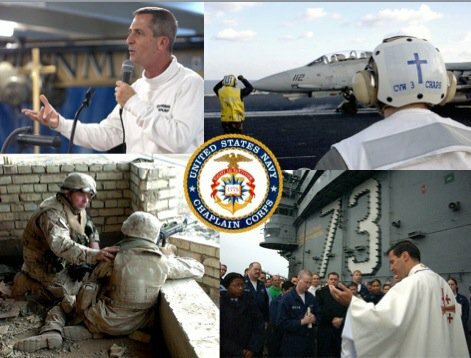 The US Navy Chaplain Corps serves the US Navy, Marine Corps, and Coast Guard. One of the Corps critical responsibilities is to advise commanders and assist them in managing the readiness and wellbeing of the warriors and sailors in these services. In this role, the Chaplains and their enlisted aides (“RPs”) are heavily involved in the human side of the changes. “As the Sea Services revolutionize to meet tomorrow’s national security challenges and the Global War on Terror, every aspect of how we employ our forces, fight wars, plan program resources, build and modernize the fleet, and manage personnel is being re-examined. This year’s Professional Development Training Course, “Ministry Tools for Times of Change,” will equip you to leverage the ministry opportunities presented by periods of significant transformation. Six Seconds was invited to deliver a two-day workshop for senior commanders on emotional intelligence and change. David Tubley, a Chaplain in the Corps, had previously attended the Six Seconds EQ Certification and Advanced Certification programs; he was assigned to serve as a partner in the customizing the course content to the needs of the military culture and worked with Six Seconds throughout the implementation. Develop a customized 1-day introductory version of The Inside Path to Change focusing on the theory of EQ and change. Support the officers to deliver the 1-day program to approximately 1000 Chaplains, RPs, and staff. Customize a 3-day followup program called “Ministry Tools for Times of Change” focusing on tools for increasing awareness and managing human dynamics of change. Deliver the Ministry Tools for Times of Change in fleet concentration areas the US and world. Managing their own changes so change remains an opportunity for ministry versus a “derailer” taking them away from their official role and purpose. Counseling individuals to cope in a rapidly changing environment. Advising leadership to effectively bring teams through change. Assisting the larger organization in a process of continuous improvement – that helps it fulfill its purpose while remaining values-based and ethical. There are many competencies required for these activities. Strategic thinking, analysis, relationship-building, and project management are required. In addition, there is a fundamentally human component of change operating at an emotional level. While essential for organizational success, change is always challenging. Although most approaches to change recognize that these challenges are both strategic and emotional, the usual premise is that with a sound strategy people will fall into line. This passing regard to the people who must execute the change leads most change efforts to fail. In contrast, Six Seconds’ approach is based on understanding the human and emotional drivers of change and engaging those to assist in forming and executing effective strategy. Emotional intelligence provides powerful insights and tools for engaging people in accomplishing critical goals. Emotional intelligence (or “EQ”) is the capacity to effectively use emotions, and it’s a key-differentiating factor of successful leaders. 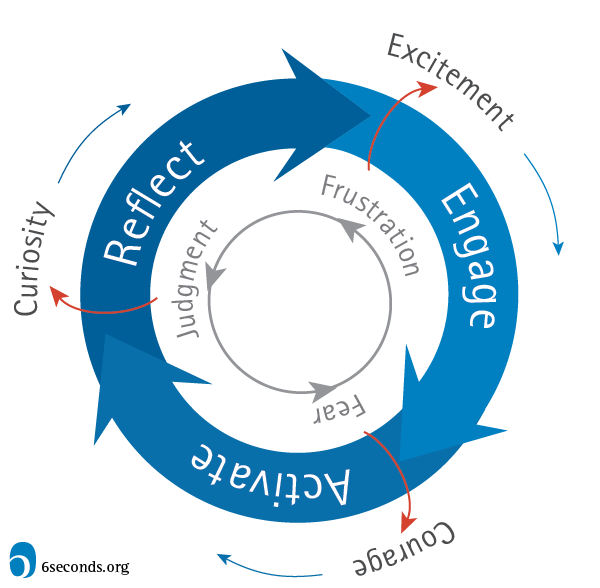 Six Seconds’ approach integrates the leading thinking on change. These theories are distilled into a practical action-learning model called the “EQ Change MAP” that helps leaders guide and sustain change. The focus is on skillfully managing the emotions that either cause people to resist or embrace change. The process helps managers develop a commitment to shared vision of a better organization, implement new initiatives while managing resistance, and then build clarity and alignment in a continuous improvement process. Engage (develop clarity and buy-in). “Engage” is about getting ready – gathering ideas, resources, strategies, and emotional buy-in. Activate (implement change strategies). “Activate” is about baby-step implementation – pilot projects and small wins. Reflect (refine strategy and learn). “Reflect” is about refining – re-assessing and improving the plans so that the next iteration builds on the previous. A key take-away from these programs is that emotions are a valuable part of change. So-called “negative” emotions can give us insight and push us for change. What are often called “positive” emotions can fuel change and sustain the change process. The EQ Change Map is a “Ready-Fire-Aim” model focused on continuous improvement. 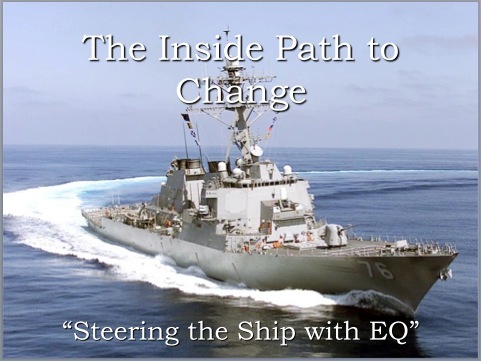 Like the Navy’s concept of an “80% solution,” the goal of the Change Map is to create buy in, take useful action, and then refine to build ongoing momentum for continuous improvement. For more explanation of the Change MAP, see the book, INSIDE CHANGE (www.insidechange.net). Following Six Seconds’ learning design philosophy, these concepts were distilled into practical tools presented in an experiential process. Both the 1-day and 3-day program used a blend of hands-on exercises, case studies, video-clips, and in-depth discussions to bring the concepts to life. The 3-day program concluded with a “Capstone” exercise where small groups developed an implementation plan with was presented before a panel of subject matter experts. The Inside Path to Change pilot and the Train-the-Trainer program utilized the Six Seconds Emotional Intelligence Assessment as prework to provide specific, individual feedback about emotional intelligence. The 1-day Inside Path to Change began with an orientation to current theories of change and the issues raised by various change theories, particularly the challenge of gaining buy-in and building momentum. 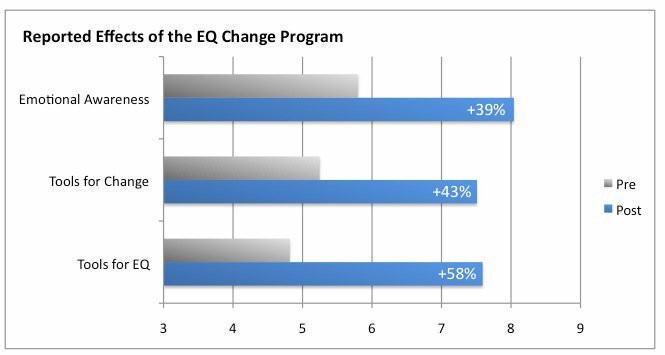 The program then introduced the EQ Change Map as a practical way to address those issues. In the Map, above, there are three red arrows shown: These represent essential emotional transitions required to create forward-moving change. Because transitions are fraught with emotion, an effective change leader needs to have insight and skill in this domain: In other words, they need emotional intelligence (EQ). The program went on to focus on how the competencies in the Six Seconds EQ Model can become assets for change leaders. The 3-day “Ministry Tools for Times of Change” built upon the orientation program going more deeply into the concepts and providing specific tools for increasing emotional awareness and management. Program topics included the drivers and obstacles to emotional change, building trust, supporting others in change, and clarifying purpose. Tools from Six Seconds’ methodology included “The Reaction Roadmap” (a process for understanding the neuroscience of emotional reactions, and options for moving out of reaction); “The Six Seconds Pause” (another look at the neuroscience of reactions); “Trust Traps” (a process for understanding trust as an emotional response and the drivers of trust); “Emotional Algebra” (an approach to integrating feelings into effective decision-making); and “Finding North” (a process for linking change to purpose). Awareness of the emotional dynamics of change: 39% increase. Processes and tools for working through these dynamics: 43% increase. Tools for teaching about emotional intelligence: 58% increase. The survey also asked participants for narrative comments about their experience and the results of the program (and for permission to quote their responses). As a result of program, are you doing anything differently as a Chaplain? If so, what kinds of different or better results are you getting? When asked about the importance of becoming more effective at change, 59% of the respondents rated it between highly important and extremely important. As individuals, change is challenging. Multiplying that challenge by tens of thousands in a large organization, it takes strong insight and exceptional skill to make change successful. The Six Seconds program provided a strong measure of each equipping these leaders to become more effective at this mission-critical process of transformation. As a result, the chaplains became more effective change agents who could understand and manage the “red lines” of the Change MAP, the human dynamics that drive the success of change. Joshua Freedman, CEO of Six Seconds Emotional Intelligence Network (www.6seconds.org), is one of the world’s leading experts on applying emotional intelligence to improve performance. Freedman was one of the designers and master trainers for the program, along with Chaplain David Tubley, Tom Wojick, Mimi Frenette, and Marek Helstrom. Six Seconds is grateful to Richard “Doc” Smith and the learning and development team at General Dynamics who helped manage the contracting of the Ministry Tools for Times of Change, and to Jonathan Frusti and Dr. Cash who helped initiate the project at the Corps’ schoolhouse. Bien joué – excellente avancée pour la promotion de l’Intelligence Emotionnelle auprès d’une Institution emblématique, rationnelle et adhocratique. Open way for Emotionnaly Intelligent Officers! My stepdad was a Navy officer, and I wish they’d had more opportunities to integrate EQ into the environment when we was serving, esp when he was returning from Vietnam. My hope is this work will make a difference for the women and men in the service — and for those who’s lives they touch while they’re serving… and when they’re back to civilian life. Of course my first choice would be that we didn’t have people in this kind of situation — but if we’re going to send our fellow humans to war, we have an obligation to give them all the tools to maintain their human-ness and make the best possible decisions in a terribly difficult situation. Fantastic accomplishment by all! Congratulations for this fine work and thank you for sharing it with us. Looking forward to more. Currently using the Roadmap to help leaders “see” the change process more clearly. Sometimes, using it as a diagnostic to frame past (recent) change initiatives and what happened, helps open the door to be more proactive or at least being open to trying new strategies. Josh, this is inspirational material and as always, presented in a very human and approachable way. The fact that the US military is embracing the concepts of EQ and how they can assist in change management on such a huge scale can only serve to persuade others in organizations large and small that there is enormous merit to understanding more about our own emotions and those with whom we work. I am excited to continue to advocate for the importance of EQ training and awareness in my next leadership position (wherever that may be – I’m still “in transition”) and I know that case studies such as this will help so much in adding credibility to a subject that sadly still meets with a certain degree of skepticism in some quarters. Thanks for sharing this. Wonderful work! Thanks for reading and responding Stephen. I agree it’s still a significant challenge to get decision-makers to “connect the dots.” It seems the AWARENESS of EQ is growing quickly, but moving from awareness to value is another step. I often hear, “This sounds amazing, but we can’t afford to invest right now…” — the next step is to show that it’s not an investment, it’s a way of stemming the bloodflow that’s pouring onto the floors of almost every company through distrust, disconnection, and even disgust…. that leads to incredible inefficiency and waste. I hope your next position arrives soon and is a place where the decision-makers are serious about creating a world-class company so you can fully engage your EQ+IQ in making that happen! Well done! Can’t thank you and the rest of the team enough for this great opportunity to serve and contribute to the men and women who serve our country. The program was inspiring and nothing I have done since has given me the same feeling of meaning and contribution this program did. Hi Tom – like you, I found this to be a great experience. I loved seeing the participants re-consider their whole view on what makes change work, and engaging with these dedicated people was inspiring. I’m so pleased that a year later, they were seeing the learning as so valuable. Thank you for your important contribution to this success!